Helicopters are not known for being the most useful bombing platforms, but some of Russia’s combat helicopters, namely the Mi-24 Hind series, are still capable of hauling these weapons. Russia and the Assad regime are putting this capability to use in Syria, as you can see in the videos below, with horrific results. There are real doubts as to what targets Russia is actually striking in Syria. Not just when it comes to what parties they are targeting, so far those largely being Syrian rebels that pose the most threat to the Assad regime, not ISIS, but also as to if the targets they are striking are valid at all. Over the last half decade, the Assad regime has been slammed for dropping crude “barrel bombs” from holds of transport helicopters over densely populated areas, a tactic that has killed scores of innocent Syrian civilians. In effect, this is just area bombing a populace for psychological purposes. Yet Russia seems to be doing largely the same, albeit with production munitions, from their attack helicopters, and to some degree, from their fixed-wing attack jets. After reviewing videos of helicopter bombing runs in Syria, it appears that they are not even using accuracy-enhancing maneuvering techniques, such as dive or toss bombing, when releasing these munitions. Hind attack helicopters, which are a decently precise weapons platform, are simply dropping dumb bombs over populated areas. As you can see in the videos above, even at low altitude, this can result in bombs landing very far apart. Even if Russian or Assad regime Hind crews have a flat bombing technique that helps calculate the bombs’ point of impact, using “dumb bombs” is still a far cry from guided munitions or even unguided rockets, which the Mi-24 is much more adept at employing than dumb general purpose gravity bombs. The only thing is, guided air-to-ground munitions, whether they are laser or TV/electo-optical or even GPS guided, are expensive. While a 500 pound bomb may cost hundreds of dollars, a single precision guided munition will cost tens of thousands of dollars. When precision is not an option, such as when a foreign power decides to fight someone else’s war on the cheap, brute unguided bombing is the alternative. What could be destroyed with a single anti-tank missile, keeping civilian casualties and physical destruction of property to a relative minimum, is instead done using a barrage of 250 kg bombs lobbed in hopes of finding the intended target. When watching Russia’s air war over Syria as it has evolved over the last two months, one might think Russia has no guided air-to-ground munitions capability at all. This is far from the truth. Russia produces a whole slew of precision guided missiles and bombs, using all types of smart guidance systems. Again, the issue is that they are not cheap, and so the powers that be in Russia have decided to rely largely on dumb bombs for the Syrian campaign. Much media attention has been given to Russia’s air war in Syria. Indeed it has been quite the spectacle, but the press needs to come to their senses when it comes to Russia’s true air combat capabilities. 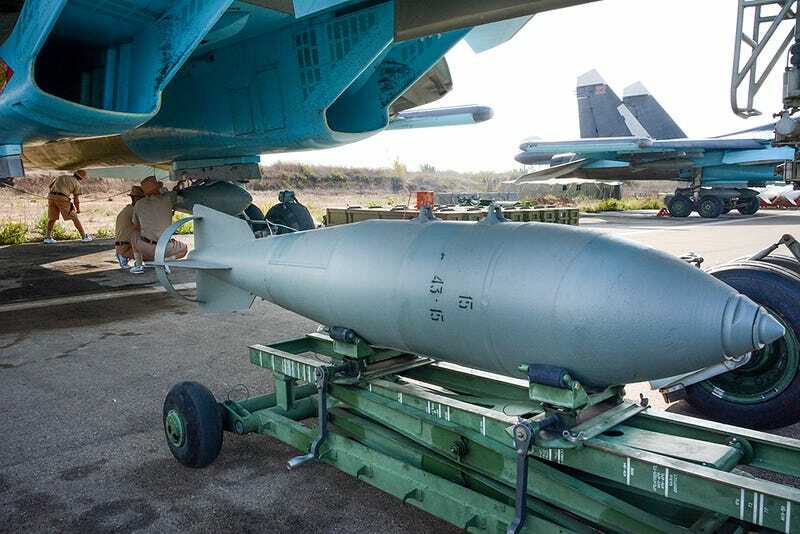 Even their most advanced aircraft, such as the Su-34 Fullback, has been seen loaded with general purpose dumb bombs more than anything else. And although about 37 fixed-wing combat aircraft may look impressive lined up on a runway in a satellite photo, it is a relatively tiny force, and one that gives Putin a big show out of a relatively small investment. The only reason these aircraft have been able to accomplish so many sorties is their close proximity of their base to their targets. Wheres U.S. and coalition jets sometimes have to travel hours to and from the battlefield, Russia’s forward deployed tactical aircraft can fly to their target and back in a matter of minutes. Additionally, the pressure to drop as much ordinance as possible on “ISIS,” which is what Russia calls anyone fighting the Assad regime, is almost certainly a factor. Are the majority of these bombs hitting anywhere near a legitamate target? We simply don’t know. When it comes to all the hype surrounding Russia’s air combat power in Syria, using helicopters to bomb cities is certainly not a sign of a cutting-edge air combat force. In fact, Russia’s Syrian air campaign has more in common with American air combat capabilities of the late 1970s to early 1980s than it does with the present. Footage of targets being attacked by Russian jets have been paraded in the press, the vast majority of which show mostly unguided weaponry being employed on supposed enemy positions and compounds in the countryside. Yet we know full well Russian air strikes are also occurring in urban areas, yet we don’t see that footage. Why? Because dumb bombs falling within a football field or two of one another in a dense urban area is not impressive looking—in fact, it’s more horrifying than anything else. Yet this is noting new for Russia, the widespread use of dumb bombs, even by their most advanced aircraft, was a staple of Russia’s 2008 war in Georgia as well. Even Russia’s recent use of cruise missiles, which awed the world to some extent, was just Russia showing off a capability that the U.S. has had for many decades, one that has no place in the Syrian war aside from propaganda and marketing purposes. All the click-grabbing headlines claiming that Russia’s cruise missiles are some sort of super-weapon are laughable to say the least, and even these cruise missile attacks were backed by Vietnam-era high-altitude area bombing from Tu-22M3s. In the end it is telling that Russia will fly 8,000 miles with its most expensive aircraft to operate, then launch million-dollar long-range cruise missiles against targets in a country that they can fly over freely—yet their daily attacks by aircraft based right within that country are made on the cheap with dumb bombs. Everything is about molding public perception, showcasing Russia’s power and marketing their weapons’ capabilities. Then there’s the question of how Russia is getting its targeting information in the first place. Its lower-end unmanned aircraft, which have been touted as primary forward spotters for attacks, are only so capable at spotting and differentiating fighters from innocents. Intelligence gained from communications intercepts and Assad’s agents on the ground may be more accurate, but combine even good targeting information with dumb bombing and there is no guarantee that these targets are actually being destroyed. What we are really watching when it comes to Russia’s offensive over Syria is an incredibly spectacular looking but highly inefficient air campaign. One that begs the question, how many fighters is Russia actually killing versus civilians in these attacks? Russia’s brute targeting methodology alone may make it nearly impossible for the U.S. and Russia to join forces in any concrete way in Syria, beyond a tacit “you do your thing and we will do ours,” which is largely already the norm. It is challenging to envision bringing Russia into a coalition when they are dumb-bombing cities via helicopter. Even if Syrian pilots are at the controls of the Hinds involved, which is unlikely, Russia clearly has no problem with the tactic as they can dictate whatever tactics they want to the embattled Assad regime at this point. Then again, it seems like choosing the lesser evil is what it is all about in that part of the world, so anything is possible. But in the meantime, although being fascinated with Putin and the reanimation of the Russian Bear is understandable, let’s not give their air campaign in Syria more credit than it deserves.